Time just flies when you're having fun! It's been almost three months since I last posted - where did that time go??? While work and family continue to keep me busy, I have been quietly working away anyway. However, with a nephew coming to stay with us for 6 months, I gave up my sewing room to youngest DS (so his cousin can move into his room) and eventually got a smaller desk set up in the dining / family area. 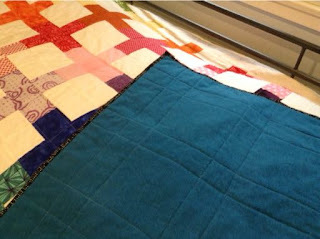 Finish Giant Chevron is quilted, binding is attached and I am in the process of stitching it down and burying the remaining threads. I've tried to flick back through my blog to find when I first started it, here in this post from January 2014 the inner giant chevron was completed, so it's safe to say I've been working on this for at least 3 1/2 years and it's moved countries twice, so it will need a good scrub before I can declare it truly finished! 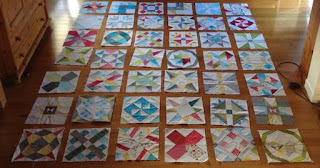 Complete remaining Vintage Quilt Revival blocks What do you think? 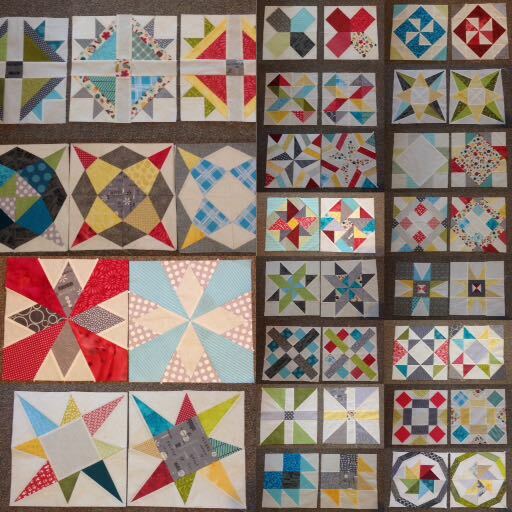 After lots of shuffling with the help of Suz, this is my final layout. I had a little play with Instagram Layout - all 42 blocks, always both /all three versions of a block together. +Suz J 's blocks on the left, then my block(s) to the right [except second set of blocks from the bottom left, I reversed the order by accident]. Isn't it amazing how different so many of them turned out? Plus Block project is done - turned out very different to how I had imagined it, but I LOVE it! That leaves me with binding (Giant Chevron), quilting (Opal Essence), improv piecing (Pohutukawa) to get my list of resolutions from January finished. 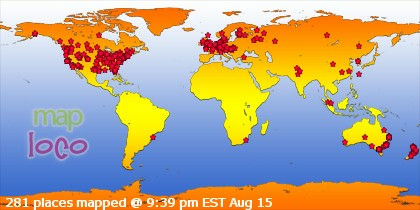 Not bad going, especially in comparison to last year!